The 4L60E transmission has been in production for over twenty years, even longer if you consider the fact that it came from the 4L60 (700R4). The 4L60 got the E at the end whenever control of the transmission was switched to the engine computer. The E stands for “electronic” or electronic shift. 4L60E Identification can be quite the chore since the transmission has been in production for so long. It is told exactly when to shift by the computer and it allows for more accurate conditions based shifting. It also allowed for more than one set of shift points to be programmed into the transmission, which allowed for tow haul mode in the trucks and high performance modes for muscle cars. The 4L60E was utilized in cars and light duty trucks. The 4L80E was used for heavier duty trucks. When it was introduced, the original small-block Chevy was still in production, and it was retained for the LS Gen III line of engines. The 4L60E bellhousing can bolt to either engine, although you may need an adapter to get a Gen III transmission to bolt to Gens I and II and vice versa. For the purposes of easy identification, I have broken the 4L60E into 4 distinct eras. These eras are easy to identify from the outside of the transmission. Really it’s 3 eras, with the fourth making sure that you aren’t getting a 700R4/4L60 by mistake. Here are a few characteristics that all years share. The one-piece case 4L60E was produced from 1993 through 1997. This is the easiest way to identify it. The 4L60 is the latter model 700R4 transmission, only the name changed, if you think you may have a 700R4 look here to identify it. GM changed its naming nomenclature into a universal standard across all of its product line. The 4 stands for 4 speed, L is for Longitudinal (for a rear wheel drive vehicle), and 60 is the torque capacity. 60 is supposed to be for 600 pound feet of torque that this transmission can handle. Although, everyone would agree that the transmission got better as time went on. 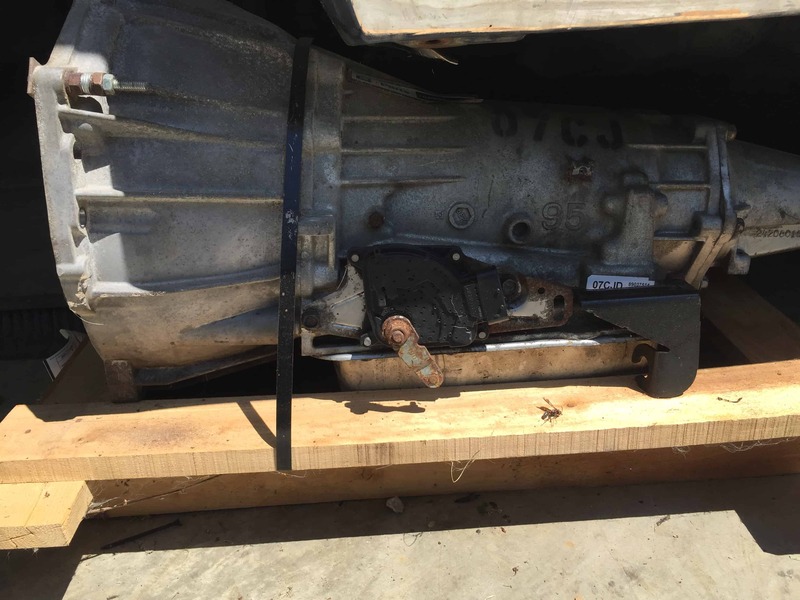 If you have a one-piece case transmission and you’d like to confirm that It is a 4L60E you’ll need to look at the code on the transmission. The year code starts over every decade, but it’s not an issue because they have a two-piece case in the 2000’s. You can now jump down to the year identification guide. The 4L60E uses a dust cover similar to that used on the TH350 or TH400 transmissions. Four bolts connect the tail shaft (or transfer case) to the transmission. The vehicle speed sensor changed locations during the production run. From 1993 to 1995 (Corvette till 96’) it was on the driver’s side of the tail shaft. From 1996 and up it moved to the passenger side. There is an information sticker on top of the bell housing at the very top of the transmission. It is impossible to read with the transmission in the car. It is very easy to read. But, if you are looking at a transmission in the car, or if the sticker has been removed, you’ll find that it has also been machined into the passenger side of the transmission at the rear corner above the pan. These have the classic 6 bolt bellhousing like the other classic transmissions that came before it. This version, as well as the 96-99 4L60E use a 298mm input shaft/torque converter. The major difference between the two-piece case 4L60E versions, is that the bellhousing bolts have slightly different patterns. This case is made to bolt up to the older legacy engine bolt patterns, such as the small-block Chevy. 9 bolts connect the transmission to the engine, which is three more than the 93-97 version. Six bolts are now used to connect the tail shaft. They only have three different types of bellhousings in North America. The most common of these is the 90 degree V6 and V8 Bellhousing. There’s also a 60 degree V6 bellhousing as well. The last bellhousing type is the special Corvette adapter. This version, as well as the 93-97 4L60E use a 298mm input shaft/torque converter. The vehicle speed sensor is still on the passenger side of the tail-shaft. The 2000 and newer model looks virtually identical to its 96-99 predecessor, but there were many improvements made to strengthen the transmission. The major physical change is to the transmission bellhousing, this was in order to allow it to bolt to the newer LS series of engines. Still maintains the six bolt pattern at the tail shaft. The entire length of the transmission is ¾” longer. The ECM connector is green from 2000-2005, and purple from 2006 and up. The 2006 and up have a black input shaft speed sensor. The input shaft and torque converter are now 300mm, which means that they are no longer compatible with each other. The 4L60E transmission is both the physical and spiritual successor to theTH700R4. It was the workhorse of the GM automatic transmissions at the turn of the century. It began replacing the 700R4 (which was then known as the 4L60) in 1997. They were both longitudinal transmissions with four forward gears and a reverse gear. The major difference between the two is the way the shifts are handled. The 4L60E uses computer control to shift. That is what the “E” stands for. Instead of just knowing the throttle position to guess engine load, the ECM uses the sensors in the engine to know exactly what kind of load it is under. This allows for optimal shifts under all conditions, which improved fuel economy and engine life. Here is a great video on Youtube from a guy who really knows his stuff. Here is a link to a forum on LS1tech.com. It has all of the codes on it. This is the most commonly used transmission for an LS swap, due to it’s relative affordability and availability. The gearing was a direct carry over from its predecessor. The 60 in its name refers to the fact that it was designed to handle 6000 pounds of gross vehicle weight. Although the acronym never changed, the 4L60E received continuous improvements throughout its existence. The later ones are certainly stronger. I’ll check out your links too. Im looking at a 4CAD TAG 4l60e trans, but can’t find the identification info on the net to see if it can withstand a 02-06 5.3 LS. Was told it came from a 04 4.3 chevy 2wd truck? Has the bolt on bellhousing and tail shaft housing. I HAVE A 2002 CHEVROLET SILVERADO 1500 EXTENDED CAB LT WITH A 5.3 VORTEC THAT TRANSMISSION LINE BLEW OFF AND I LOST ALOT OF TRANSMISSION FLUID IN ABOUT A TWO BLOCK DISTANCE OF DRIVING IT. I FIXED THE LINE AND CONNECTED IT BACK TO RADIATOR, PUT 4 QUARTS OF TRANS FLUID IN IT AND DROVE IT HOME (MAYBE 5 TO 8 MILES)WITH NO PROBLEMS. IT SAT OVER NIGHT WHEN I GOT IN THE NEXT MORNING IT HAD NOTHING, NO REVERSE, NO DRIVE TO AMOUNT TO ANYTHING AND AFTER A FEW MINUTES IT STOPPED PULLING ALL TOGETHER. I JACKED THE REAR END UP TO SEE IF IT WAS PUMPING AT ALL AND BACK RIGHT TIRE DOES SPIN AS THOUGH PULLING, BUT WHEN YOU HIT GAS PEDAL IT STOPS THE WHEEL ALL TOGETHER. I’ve got a 2008 avalanche and two transmission and one torque converter how am I to know?